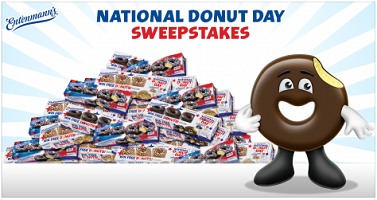 Enter daily for your chance to win the 2015 Entenmann’s National Donut Day Sweepstakes! Ends July 3, 2015. Have Fun and I hope you win!!! ENTRY PERIOD Prizes (50) (Five (5) per Entry Period): Each Entry Period winner will receive a prize package consisting of one (1) Entenmann’s donut coupon (each coupon is for $7 and will cover the cost of a box of donuts) and Entenmann’s Mr. Rich Frosted and Ms. Crumb Plush toys. Approximate Retail Value (“ARV”) of each prize package: $22. (100) Grand Prizes: Each grand prize winner will receive Entenmann’s products for a year, awarded as fifty two (52) coupons, each redeemable for any Entenmann’s product up to $7.00 in value (excluding sales tax). ARV of each Grand Prize package is $364. Total ARV of all prizes: $37,500.